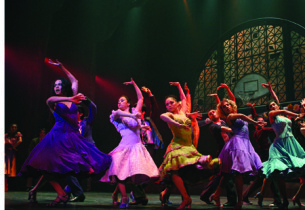 The production opens with a danced Prologue indicating the bitter tensions between the Jets, a self-styled “American” street gang, and the Sharks, a group of young Puerto Ricans. The leader of the Jets, Riff, swears to drive the Sharks, led by Bernardo, from the streets (“Jet Song”). Riff determines to challenge Bernardo that night at a dance in the gym, and prevails upon his old friend and the co-founder of the Jets, Tony, to help him. Tony has been growing away from the gang, and feels the stirrings of other emotions (“Something’s Coming”) but agrees. 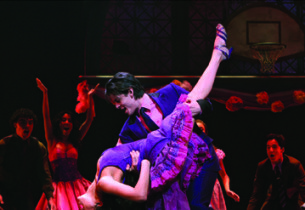 Bernardo’s sister Maria, newly arrived from Puerto Rico to marry his friend Chino, attends the dance (“Dance At the Gym”) and, despite the obvious hatred between the gangs, meets Tony, who at once falls in love with her (“Maria”). Later, after the dance, while the gangs begin to assemble at Doc’s drugstore to choose a place and weapons for their rumble, Tony visits Maria on the fire escape of her apartment, and they pledge their love (“Tonight”), promising to meet the next afternoon at the bridal shop where Maria works. As he departs, the Sharks take their girls home and go off to the drugstore, while a playful argument develops between Anita and two homesick Puerto Rican girls over the relative merits of life back home and in Manhattan (“America”). At the drugstore, the Jets are nervous about the approaching meeting with the Sharks, but Riff advises them to play it cool (“Cool”), and when the Sharks arrive, an agreement is reached, at Tony’s insistence, to have a fair, bare-handed fight between the two best fighters in each gang the next night, under the highway. Next day, Tony meets Maria at the shop, and among the clothing dummies they enact a touching wedding ceremony (“One Hand, One Heart”). Maria makes him promise to stop the fight between his gang and her brother’s. In the quintet “Tonight,” Tony and Maria sing of their love, Anita makes plans for a big evening, and Bernardo and Riff and their gangs make their own plans for the rumble. In a deserted area under the highway, the gangs meet for the fight. As it is about to get under way, Tony hurries in and begs them to stop, as he has promised Maria. Bernardo, enraged that Tony has been making advances to his sister, pushes him back furiously. Suddenly switchblade knives appear, and Riff and Bernardo begin to fight (“The Rumble”). In the ensuing action, Riff is knifed and Tony, grabbing his weapon, in turn knifes Bernardo. Frenzied, the gangs join battle, until they are interrupted by a police whistle. They flee, leaving behind the bodies of Riff and Bernardo. In her room, Maria, unaware of what has happened, is gaily preparing for her meeting with Tony (“Me Siento Hermosa”/“I Feel Pretty”). Chino bursts into her room and tells her that her brother has been killed by her lover; then seizing a gun, he rushes out in search of Tony. Tony, however, has climbed the fire escape to Maria’s room, and in spite of her grief she is unable to send him away. Clinging together desperately they envision a place where they can be free from prejudice (“Somewhere”). In the streets and alleys the gangs flee the police, panic-stricken by the killings. Two of the Jets, Action and Snowboy, have already been questioned, and they explain to the rest of them how to handle the adults (“Gee, Officer Krupke!”). The sorrowing Anita knocks at Maria’s door, and Tony leaves by the window, taking refuge in the basement of Doc’s drugstore. Anita upbraids Maria for allowing Tony to come near her (“Un Hombre Así”/“A Boy Like That”), but Maria’s answer (“I Have a Love”) carries its irrefutable force, and at length Anita agrees to go warn Tony that Chino is gunning for him. She goes to the drugstore, but is brutally taunted by the Jets for her nationality. Finally, in hysteria, she spits out a different message for Tony: that Chino has killed Maria in revenge. Doc tells Tony what Anita has said, and Tony leaves his hiding place, wandering numbly on the streets. At midnight, he runs into Maria, who has been searching for him, but their moment is brief. Chino appears from behind a building and shoots Tony dead. the stunned gangs, the Jets and the Sharks, appear from the shadows and, drawn together by the tragedy, lift up the body of Tony and carry it off. Broadway legend Arthur Laurents often liked to revisit the shows he helped to create. He was the motivating force behind the revival of Gypsy, starring Patti LuPone, and again behind the first official revival of West Side Story, which opened at the Palace Theatre on March 19, 2009, and ran for 748 performances. 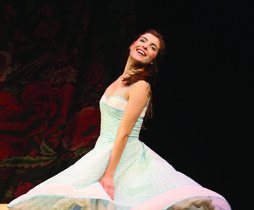 As the book writer for the celebrated show with music by Leonard Bernstein and lyrics by Stephen Sondheim, Laurents thought it would make sense to have the gang of Puerto Rican toughs and their girls speak Spanish on occasion, instead of English; as the director of the show, he decided to tamper with the sacrosanct staging by Jerome Robbins (though he and choreographer Joey McKneely retained Robbins’ definitive dance steps). The result – a work that was illuminated by these modifications, beautifully serviced by a cast in which the dominant notes were sounded by Josefina Scaglione, making her Broadway debut as Maria, and by Karen Olivo, a Tony® winner for her interpretation as Anita. 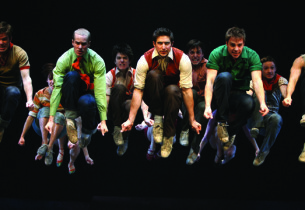 Find Sheet Music for West Side Story at Musicnotes.com. Click here! 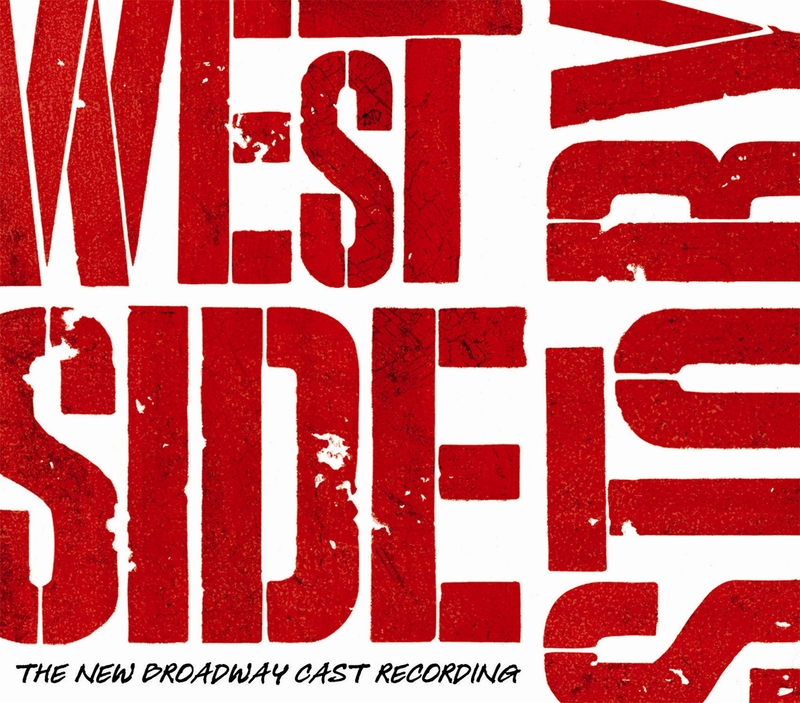 Watch the New Broadway Cast recording session of West Side Story in the Video Spotlight! 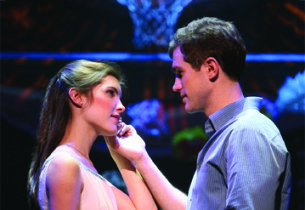 News: Grammy-Award Nomination for West Side Story!